I made all my line edits. The page format goes wonky after page 263, not sure why, but I’m positive you can fix it. It might be the index. Give it a good looking over, especially the font type and size changes. Please check to make sure the chapter and subtitles in the TOC match the page numbers. I adjusted them for the wonkiness at the end. I will email you a picture tomorrow of the date stamp and my signature for page v, the Author’s Note. I deleted my Note on the Author at the back of the book and want it just on the back cover. Also related to the back cover, I’d like to divide it in thirds, kind of like the front. (Can I edit the text on the back cover in createspace? If so, I will. The bottom will be for my bio and photo. I hope to have a list of reviewers for you tomorrow. Any questions? You know where to find me. Thanks for a great session today! Stump the Librarian: A Writer’s Book of Legs is a diverse collection of creative writing that explores Alan Samry’s life as a congenital below-knee amputee and a public librarian. Alan’s cross-genre writing in creative nonfiction, poetry, essays, satire, scholarship, and experimental writing weaves fascinating mythical, historical, and literary figures into his own absorbing story of being a “born amputee.” In the book, with chapters organized as though the reader were exploring a public library, Alan writes about his experiences in an open, insightful, and humorous way. In his search for other leg amputees, Alan finds a new way of seeing himself, and the world around him. Alan Samry is a congenital amputee and a native of Cape Cod. In 2005, he and his wife, Susan, moved to Fairhope, Alabama. Alan earned a bachelor’s degree from the University of South Alabama, and an MFA in Creative Writing from Spalding University. In 2017, he earned an MLIS from the University of Alabama. He has been a dishwasher, a landscaper, a liquor store manager, a wine salesman, and an award-winning reporter. 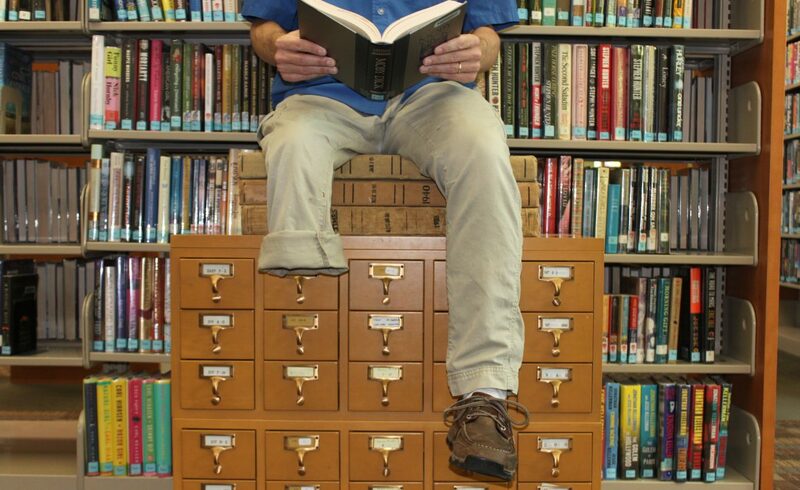 He is a part-time public librarian and an adjunct instructor at Coastal Alabama Community College. When the weather’s nice, Alan enjoys riding his bike to work. If he’s not working, look for him at his local coffee shop, bookstore, or brewery. Send date and signature to John for end of Author’s Note. Next postMy First Book is On Sale Now! What’s the Best Christmas Present? My First Book is On Sale Now!